Cornwall Ontario – A CFN viewer emailed in upset over an alleged cover up over a missing gun from the armoury. We get lots of information from the public. Each case has to be evaluated and of course verified because even a gonzo newspaper has to tell the truth. The Armoury is home to the SD&G Provincial Liberal Riding Association SD&G Highlanders. The police confirmed that a gun was reported stolen, but that it’s still under investigation and that they would release no further information. According to the source the gun was stolen months ago and they are alleging a cover up. 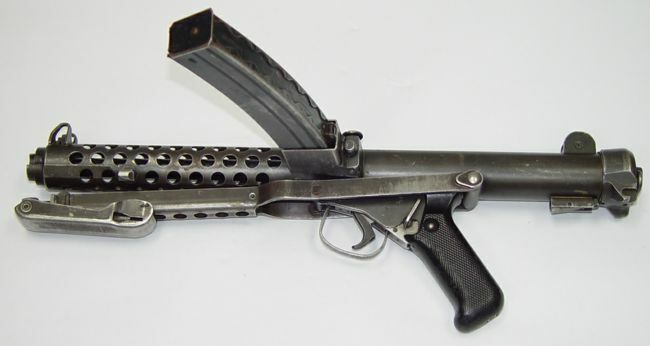 The gun, according to the source, is a C1 sub machine gun, modeled on the British Sten gun, that was on display. While it was missing its firing pin, according to the source it could be replaced or fabricated in this internet age. A call to the unit, where Captain James Borer (former Liberal Riding Association President) is the media rep, was not responded to however we did get a call from the military in Toronto who simply wanted to know when our story deadline was. Chain of command in the military is a reality of their lives of course. The bigger questions are why wasn’t this reported via the police blotter? Why wasn’t the public informed that a sub machine gun has been floating around? And how could a gun on display in an armoury go missing? Isn’t the point of an armoury to safeguard weapons in case of time of need? If it wasn’t for this source would the public ever know, and of course how many other weapons have gone missing that have also not been reported? All legitimate questions. While at the end of the day someone may simply have wanted a souvenir to hang on their wall surely a 9mm submachine gun on the loose is something the community should be concerned over? What do you think dear CFN viewers? Does the Armoury need to be investigated? Should it be allowed to hold any weapons in a city of this size if they can’t be secured? You can post your comments below. Uh…modeled on the STEN gun Jamie, not the BREN gun. The two are as different as chalk and cheese. I fired the Sterling in the reserves. It is about as accurate as a tabloid quote and most shotguns have a better effective range. I seriously doubt that anyone need panic, especially since there is no firing pin – not exactly something that is in stock at Cabela’s. This SMG should have been permanently disabled, which is a high threshold to meet mechanically, not just have the firing pin removed. I suspect this SMG could be made to fire with parts readily available on the internet, hence the cover up. Why else would we not hear about it ? Someone is in deep doo doo. We need the whole story. For repeat fire ability and maximum load I recommend the democratic fountain pen. It can be synchronized to fire off fact, satire, love poetry or rant without a delay mechanism. It has a rebuttal of censorship and the occasional charge leading to a kangaroo hanging but apart from that, good penmanship is a superior method to hitting targets and so long as you have blood you never run out of ink. It’s not so much a concern that the gun will be used on the citizens, it’s really about why they are keeping it quiet, covering this up, just goes to show you they protect their own, no matter how incompetent. The police have no problem smearing everyone else’s name in public before they have their day in court, so who are they protecting? Jerry you are 100% right.